Phenomenon was recently contracted by Modere to style the shop, entrance and breakout areas for their Retail Conference, held at the Perth Convention and Exhibition Centre in February 2019. With a focus on environmental sustainability and toxin free living, Phenomenon created a clean, fresh space for guests to relax in between conference sessions. They provided the client with 3D renders of the space in the planning stages so they could visualise the overall look. The shop was minimalistic with natural finishes so the products available could shine. White cabanas were combined with wooden beam ceilings, oversized lamps and neutral display cabinets with custom branded signage. Greenery and potted plants added texture and colour to the space. 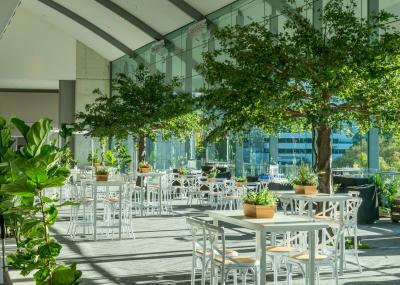 In the breakout area Phenomenon’s new 4m trees framed the Hamptons style tables and chairs, where guests and stakeholders could network and recharge. Overall it was an innovative and interesting space, and Phenomenon enjoyed creating it as much as delegates enjoyed relaxing in it.